'Tis the season (almost!) to be jolly and when guests come to enjoy the holidays you don’t want to be stressed and worrying about last minute prep. Here are some simple, inexpensive ways to deck your guests’ halls and keep you merry versus weary during their stay. PILLOW TALK: Place a variety of shaped and sized decorative throw pillows on your guest’s bed in bold colors like this year’s Pantone color of the year radiant orchid or find those with holiday patterns accented with festive golds, reds, and greens. THROW IN SOME COLOR: Put a colorful throw on your guest’s bed to add a splash of color (coordinate with your pillow choices!) Have a basket full of additional colorful throws in different textures and thicknesses too so your guests can customize their bed’s layers for personal temperature control and comfort. SHIFT SHEETS: If your guest beds haven’t been used in a while, put clean or new sheets on them the day before guests arrive to ensure no allergy-causing dust, bugs, or pet hair have gathered on or within. MIRROR MIRROR: Hang a mirror either as a decorative accent or on the back of the door so guests can get ready in the privacy of their rooms without having to go to the bathroom to check themselves out. You can also provide handheld mirrors for little cost to keep on bedside tables. If you’re feeling crafty ‘n creative drape garlands over them; spray with frosted window decor, or arrange different sized stick-on snowflake decals on the frame for a wintery effect. SOFT STEPS: If you have hardwood floors, put small area rugs next to guest beds. They’ll make midnight bathroom runs warmer and more comfortable on your guests’ feet and reduce the noise from creaky floorboards. SOCK IT TO ‘EM: Fill a small basket with heavy socks or slippers with a holiday motif in bedroom closets as well, since cold feet have a major influence on body temperature as a whole. BUDS FOR YOUR BUDS: Put fresh flowers on nightstands or bureaus. 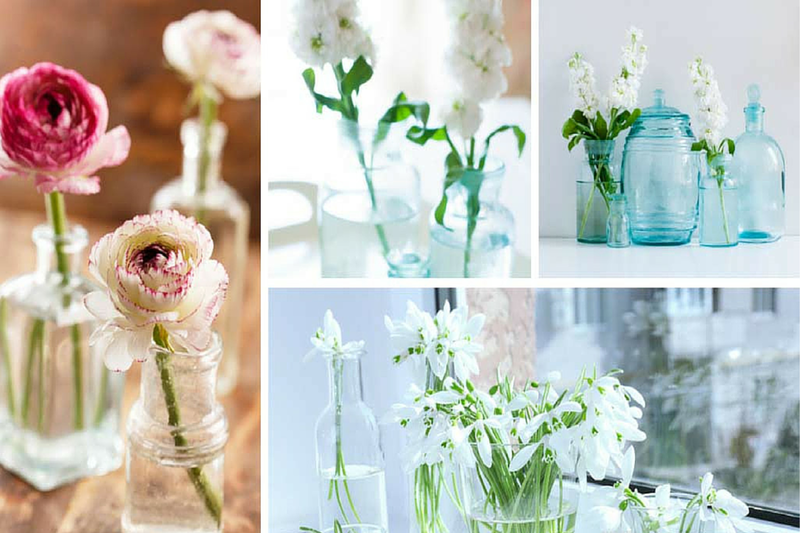 Just a stem or two in a vase will make a delicate and tasteful statement. If you’ve got a black thumb (like me! ), succulents like Hens and Chicks which look pretty and do well in cold weather. Potted (but cute) plants that don’t need much maintenance will live longer then fresh flowers. Artificial flowers are also a terrific option! GOODIE BASKET: Keep a small basket at your guest’s bedside containing bottles of water and fruits in holiday colors like golden or red apples and green pears to avoid late night fridge runs. Include napkins, small paper plates and plastic knives for easy slicing and mess prevention. GOOD READS: Have magazines and books in baskets or on shelves where they’re easy for guests to see. If you have an extra Kindle and IPOD with docking station that’s another nice touch! PICTURE PERFECT: Find photos of you and your guest prior to their visit. Display your faves in a frame on your guest’s dresser or nightstand. Invite your guests to bring old photos of their own too so you can all reminisce over sipping some spiked egg nog! HANG TEN: Supply extra hangers in closets. This way guests can keep their clothes looking great and not have to live out of their suitcases! TECH THE HALLS: Put power stations or power strips in bedrooms so guests can keep their cell phones and tablets charged. If possible, place power strips near beds so guests can enjoy an e-book or some digital bedtime Sudoku without having to get back out of bed to re-charge their tech. GO MINI: Buy travel size toiletries and put them in baskets on bathroom counters. You can also use all those free samples of skin cream and perfume that you've collected from your shopping ventures or small lotions you’ve collected from your hotel stays. COLOR CODE IN YULETIDE MODE: Outfit each guest bathroom with different color toweling for each guest so they can remember whose is whose. RACK IT UP: Use a hat or coat rack, a small decorative ladder, or an inexpensive over-the-door hanging towel rack or shoe bag to prevent towels from being left on floors. Hanging them will also insure wet towels dry thoroughly to avoid mold and mildew growing. HOLIDAY LIGHTS: Plug in scented night lights along common pathways (like from the guest bedroom to the bathroom) to prevent stubbed toes when your guest is ‘on the go’ in the middle of the night.